Heart failure is a chronic and serious condition. However, with the right treatment you can lead a full and active life. An important part of your care is keeping track of your symptoms. If you are in stage three of heart failure you need to monitor your symptoms carefully. According to the New York Heart Association's (NYHA) Heart Failure Symptom Classification System, there are four stages of heart failure and they all have the same symptoms. The difference is that the severity of your symptoms depends on the stage you are in. In stage three, symptoms are more prominent and likely to limit your activities then in stage one or two. Stage four symptoms can become disabling, so if your stage three symptoms get worse, you need to see your doctor right away. 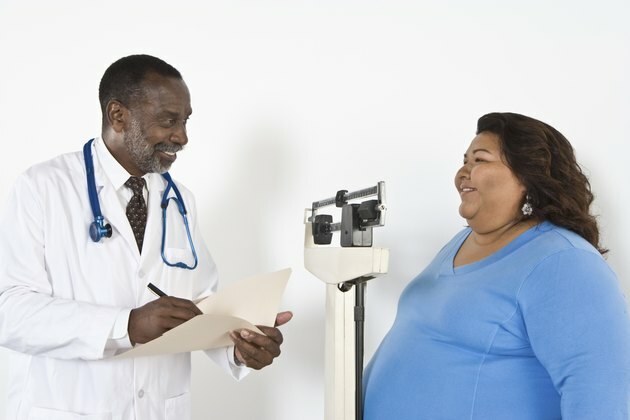 Weight gain is a common symptom of heart failure. It can come on suddenly or happen over time. This weight gain is the result of fluid accumulation. According to the American Heart Association, if you are in any stage of heart failure you should be on the lookout for a sudden weight gain of three or more pounds in one day, five or more pounds in one week or whatever amount of weight gain your physician suggested you make note of. The AHA recommends weighing yourself every day. "preferably every morning, before breakfast and after urinating, with the same type of clothes on, without shoes, on the same scale and in the same spot." The National Institute of Health states that another common symptom in stage three heart failure is being short of breath. This can happen even while at rest and lying down. You may also have trouble sleeping and be woken up needing to catch your breath. Propping yourself up on pillows may relieve your symptoms when lying down. Being our of breath may or may not be present with extreme fatigue or unusual tiredness. In some cases you may become short of breath while being active such as walking or climbing stairs. If your condition progresses, your shortness of breath can become disabling. According to the Heart Failure Society of America, other symptoms you may experience with stage three heart failure include fluid retention due to the heart's inability to pump fluid through the body and the kidneys' inability to dispose of sodium. This may lead to swelling in the legs, ankles, lungs or abdomen. This fluid retention can cause you to feel like you are choking. You may also have stomach pain, loss of appetite, upset stomach and a frequent dry, hacking cough. Your cough may also produce blood or white or pink blood-tinged mucus. Your heart rate may become irregular, you may have periods of feeling disoriented or confused and you may experience dizzy spells.